Tribeca Review: "Joan Rivers - A Piece of Work"
In their candid documentary "Joan Rivers – A Piece of Work," filmmakers Ricki Stern and Annie Sundberg deliver an all-access look into the life of a comedic icon whose hatred burns brightest at the thought of relinquishing the spotlight she covets. Shot over the course of a year, the film follows the 76-year-old comedian keeping pace in an industry constantly gravitating toward youth and beauty. While she combats the aesthetic effects of age with plastic surgeries and Botox shots galore, the common denominator the film depicts so well is how Rivers stays fresh by being simply hilarious. The film intersperses choice clips of her television appearances over the years that depict her evolution as a comedian nicely. Surprisingly the best moments of the film come from her present day act. Her contemporary uncensored stand-up is topical, often raunchy, far from politically correct, but always sharp for a comedian of any age or gender. There's stellar footage of her weekly surprise comedy club appearances in Manhattan. She keeps the crowd in hysterics by her liberal use the c-word and other profanities, while musing about such subjects as a mid-coitus peek at her BlackBerry. Standup gives Rivers the attention fix she needs to offset the anxiety and dread she feels at the thought of it ever coming to an end. Whether she is performing at a second-rate casino in rural Wisconsin, or jesting she would knock out her teeth for a shot at doing a denture cream commercial, Rivers is unapologetic about her constant pining for adoration. What makes "A Piece of Work" such compelling viewing is the way Stern and Sundberg not only portray Rivers' omnipresent awareness of the dark side of the curtain, but how she often adopts a Zen-like acceptance toward the entertainment world's less admirable qualities. It's a survival mechanism for her no doubt, but it makes for an engaging story -- wanting to remain a player in a cold and fickle industry that's done its fair share of kicking her around over the years. 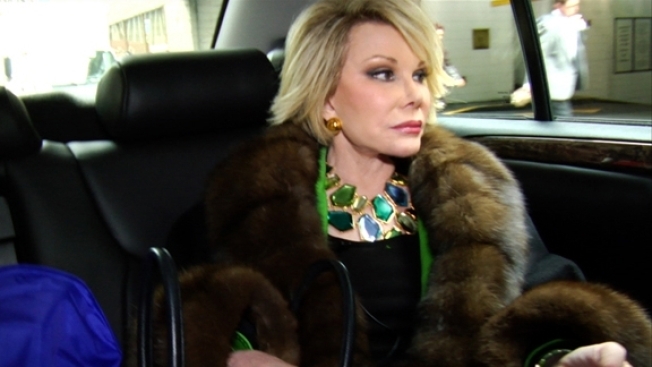 It becomes perfectly clear while watching "Joan Rivers – A Piece of Work" that she will not leave quietly as long as the laughter continues to follow her - and it will. The film leaves little doubt regarding this because, as Rivers accurately assesses it, "I will always do something funny because I'm a funny person."